Capri Italian Bakery in Dearborn, MI provides quality products and exceptional customer service. We sell pizzas, pastries and dry goods. 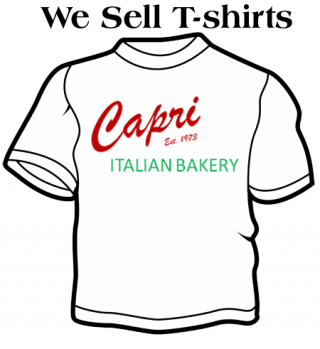 Whether you "grew up" on Capri Bakery or you are meeting us for the first time, we make you feel like family. In business for 44 years, third generation owners, John & Ronda Errigo work hard at keeping family traditions alive while also integrating new items into the menu. We are a retail bakery selling more than just bread. We make everything from scratch and hand roll our products every day. Only the highest quality ingredients go into our bread, pizza, and pepperoni rolls to ensure consistent good food at a great price. Our pizza and pepperoni rolls are locally famous for a distinct taste people crave. When you walk in and smell our fresh breads baking, you will be tempted to try a new one each visit. Our traditional Italian breads are made in a variety of shapes and sizes as well as specialty breads such as cinnamon raisin or garlic cheddar onion. Try one of our many cookies, pastries, & pies to satisfy your sweet tooth. Check out our menu and product links to see all we have to offer. You are welcome to sit at our tables to enjoy your lunch while surfing the web or take it to go. Our friendly staff will make you feel right at home and are happy to serve you. Come in or call to place your order. We would love to hear from you. Copyright © Capri Italian Bakery. All rights reserved.